In 2014 many of our favourite novels are hitting the big screen. 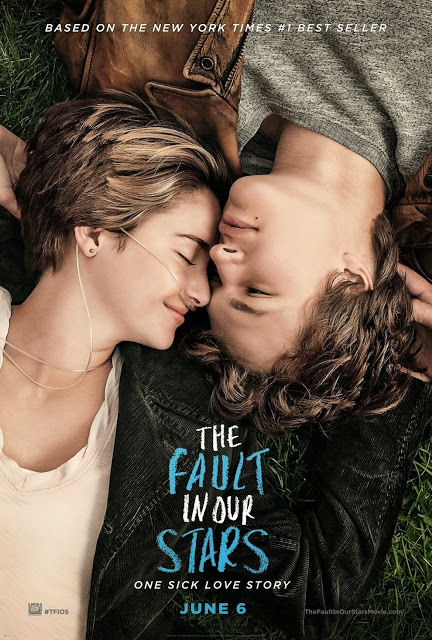 With upcoming book adaptations like Vampire Academy, Divergent, Mockingjay Part 1 and the one I'm most excited for, The Fault In Our Stars. Book adaptations can be a good thing and a bad thing. They have us readers in a combination of excitement and nervousness. Catching Fire showed us that when an adaptation follows it's book, then the result is an excellent film that us fangirls/boys can be proud of. Whereas some book adaptations have totally fallen down the drain *cough* Beautiful Creatures *cough*. Don't get me wrong I'm not saying it was a bad film, I haven't even seen it. But have you ever wondered why not many people have spoken about it since? I think it's best to view both the book and it's film as separate pieces of art but.. I find that an extremely hard thing to do. They both impact each other. I believe that even if the movie isn't successful it doesn't change the book but ask yourself this: 'If you watched a movie adaptation before reading the book and didn't enjoy it, would you still read the book?' Personally in some cases it depends and I'm always going to read the book before seeing it's adaptation. But for most non-readers the answer would be no. This also works visa versa, if a movie is good more people are likely to read the book. But if you really want to expand your audience and have a cinema that's not only readers, I think having the correct approach and marketing is a big factor. It breaks my heart to see upcoming books adaptations that are poorly marketed and I think that happened with City of Bones. It was hardly advertised in Australia and it was easy for non readers to make assumptions and comparisons before having seen the film. For example, after the whole twilight faze people tend to avoid or make fun of teen targeted vampire films which could affect the Vampire Academy film. From what I've heard Vampire Academy has nothing to with Twilight but because it's of the same genre a lot of people would easily label it 'the next twilight' or 'just another vampire movie'. But I think it's really smart the way they've approached the VA movie. I don't know what the book is about but the trailer makes it seem like a less serious, more humorous film. Which I think is going to separate it from other Vampire films and people will be less likely to draw comparisons. Which leads me to my next point. What if some things just can't be expressed on screen? Reading is a very personal thing, and I say that because you are in someone else's headspace and that bit of connection can make a whole lot of difference. Whereas with films, it's down to the actors to be able to really portray the characters and genuinely make their audience feel something. That connection is vital. Books take you on journeys, bring you to different worlds and make you're heart feel something and I can't think of anything more magical. This is a hard job to do, but I believe it can be done and when done well, it's awesome. Who wouldn't want their favourite book turned to film if it could be guaranteed perfection? I think it's best to remember that there is never going to be a cast that pleases absolutley everyone. Someone is always going to object, which is totally fine. Because everyone imagines different characters differently in their mind and not one person is going to pinpoint all of those qualities, for everybody. What does count though, is how they embody and portray the character. Which is why I've come to terms with the casting of 'Gus' in the TFIOS movie even though I envisioned him differently. Overall book adaptations I will admit, make me nervous. And I think that there are some books that maybe shouldn't be on the big screen. But I have faith within the cast and crew of these movies, and that they will meet our demands as best as they can. Because sometimes we forget that they really want these films to be successful too. Even though I don't sound it, I'm actually very excited for the list of book adaptations coming our way this year. There are so many good ones! I know I'll be taking numerous trips to the cinema this year and I'm already fangirling about new movie stills. How do you feel about book adaptations? Which one are you most excited for? Oh I totally agree! We've had many discussions on this one and it's always disappointing when it doesn't go well. Although Hunger Games and Harry Potter are probably the best examples of when it goes right. I'm totally on the same page! When I hear that a book is being made into a movie, I get both super excited and terrified at the same time. Catching Fire is AMAZING and, in my opinion, the movies are better than the books (I feel so much like a traitor when I say that!). But films like Beautiful Creatures (never seen it either but still), Percy Jackson and The Host were such terrible movies. If one of my books were going to be turned into a film, I'd be really scared. John Green said that the film is brilliant and he cried several times whilst the production was happening, so I'm not worried about that one, hehe. I'm planning to read The Book Thief soon in time for the movie. And I'm so excited about Divergent :D Great discussion, Sunny! Lovely article Sunny, I think you are so right about the way they are portraying VA. It couldn't be made more different from Twilight, and everything in its market to the trailer and movie itself shows that. I hope it will be successful because I can't wait to see it. Regarding books not being adapted to film, I can agree with you there. I was surprised to hear that The Book Thief was going to be made into a movie and after viewing the trailer, I'm still unconvinced. A big part of why I loved the book was the artistic nature of it, and how it was narrated by death, but it doesn't seem so in the movie. We'll see I guess! I totally agree with you! The ending of Catching Fire was pretty disappointing when compared to the book, am I right? However, I've got my fingers crossed for The Fault In Out Stars - I'm hoping it will be pretty good! I'm so excited for The Fault in Our Stars because of *sob* Augustus, and I'm really nervous to watch The Book Thief. That book made me cry and I'm desperately hoping that they do a good job with the emotions in that movie. I am so nervous about Divergent; as I've seen the trailer and it doesn't look like it's kept with the heart of the book, and it has become quite cliché of trying to be the next Hunger Games. Then again, I am extremely nervous about Mockingjay, and how they will bring District 13 and the Rebellion alive WHILE keeping it at a 12A rating.